Josh and Matt are ready to become dads together. Follow every step of their journey here. My friends Nina and Kirsten decided to take me out for a sort of pre-kids bachelor party. “Who knows when we’ll ever get to do this again?” Kirsten said. We started with dinner at Nizza in Hell’s Kitchen. “We’re going to need a bottle of that prosecco,” Nina said to our server. Soon we were eating plates of pasta, drinking our bubbly drinks, and talking non-stop. After dinner, Kirsten and I thought we’d all head home, but Nina had other plans. 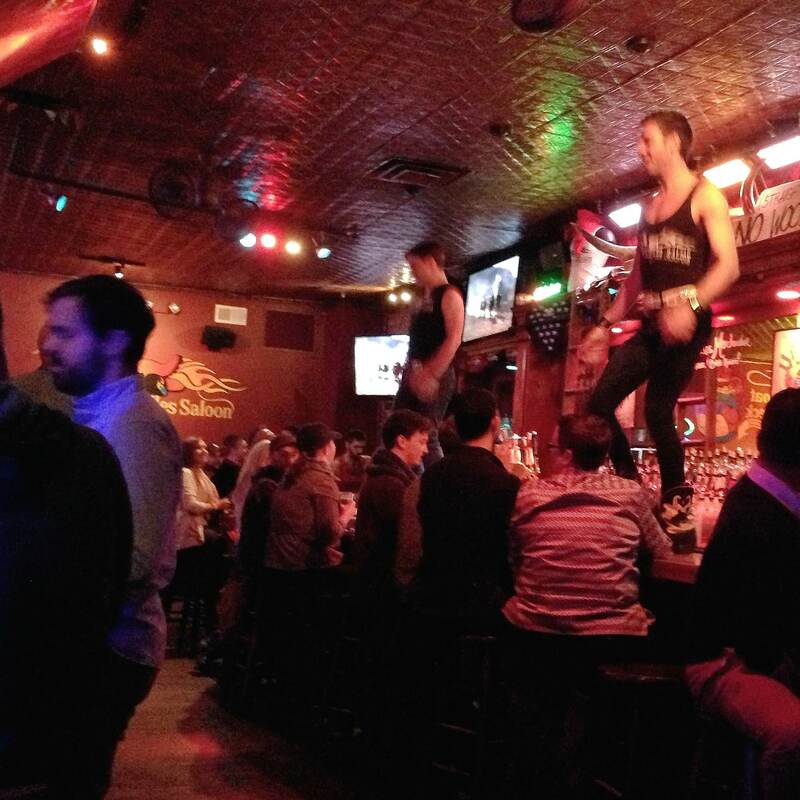 That is, of course, how the three of us ended up at Flaming Saddles, the pseudo-country gay bar where the cute bartenders do line dances on the bar top between pouring drinks. As Nina worked on her martini, and Kirsten and I drank our Jameson-and-gingers, we talked about Nina’s kids, and Kirsten’s latest writing project, and watched the bartenders do a few dances on the bar top. “I’m really going to miss this,” I said as the night wrapped up and we collected our things. Soon we were on the corner, hailing Nina a cab. “We’ll come and visit you when the twins are born,” Nina said. As a new dad staying home with twins, I’ll probably be so excited to see them when they come over that I’ll be the one doing dances on tabletops. But quietly, of course, so I don’t wake the sleeping children. 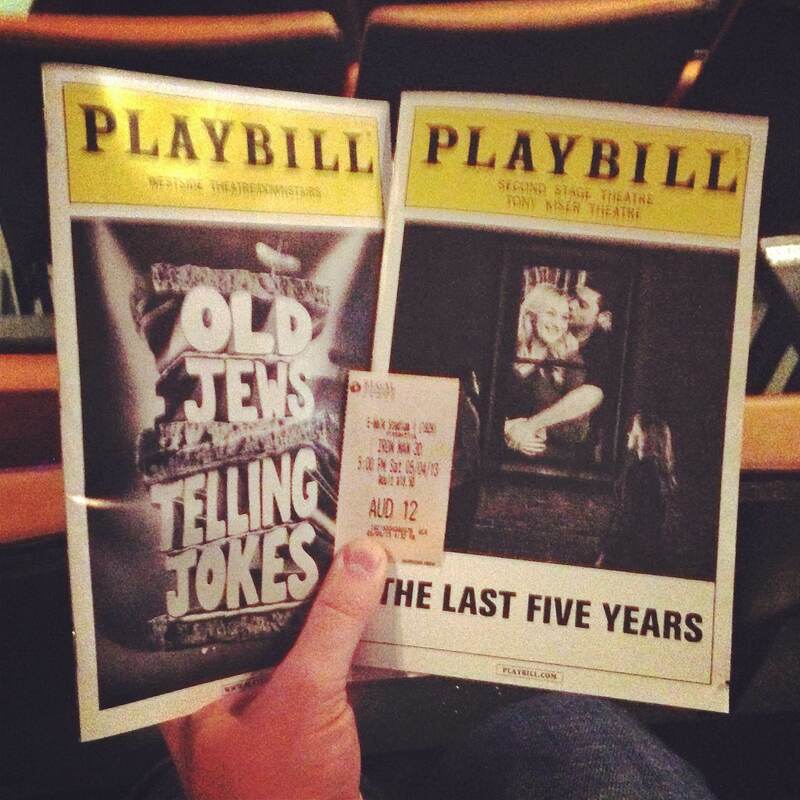 On Saturday, our friend Josh S. (yes, another Josh) gave us tickets to the Off-Broadway comedy Old Jews Telling Jokes. So we hit the TKTS booth in Times Square, and suddenly we had half-price tickets for the 8 p.m. show. But, of course, what to do with the four hours before the performance? 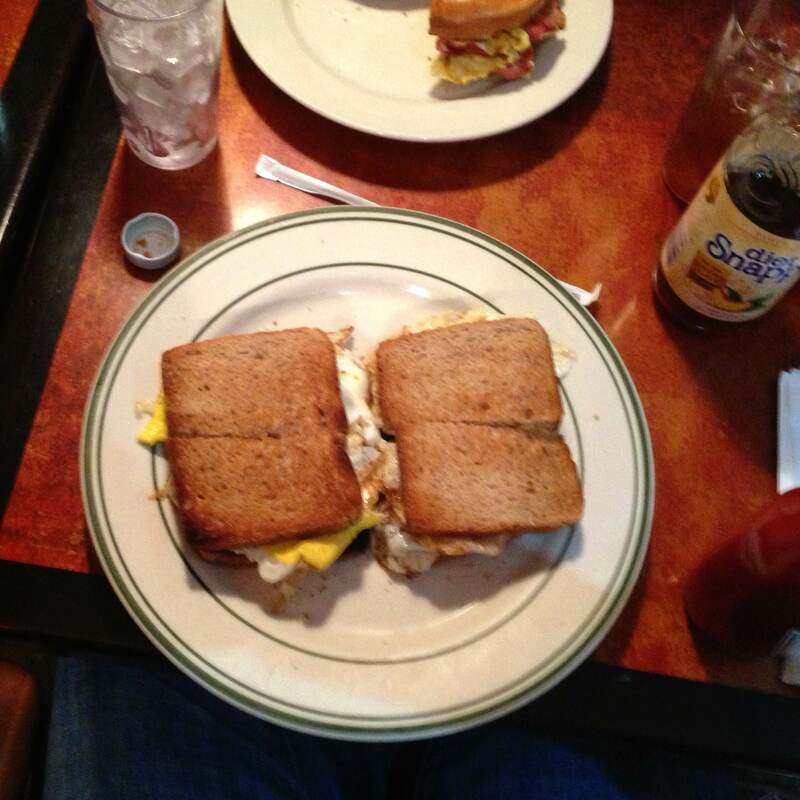 Why, an early dinner at Junior’s, of course, followed by the 5 p.m. 3D screening of Iron Man 3. Two shows in a day, with a movie sandwiched in between, plus two meals out? So decadent. So fun. After Iron Man 3, which we both enjoyed (so impressed with the series’ ability to balance action with comedy), we headed to our final show of the day. I can’t say enough about The Last Five Years. It’s now among my top-five favorites musicals. We laughed. (A lot.) We cried. (A little.) It was the perfect ending to our cultural excursion. We finished our marathon day with drinks at Therapy, where we met a couple of friends and chatted over cocktails. By 1 a.m. we were back in Astoria, at our favorite all-night diner, putting away some breakfast food and reminiscing about our last-chance do-it-all-now-before-kids day of adventures. Couldn’t have asked for a more fun day, or a better baby bachelor party. When Matt and I took our twin infant parenting class, one of the recommendations Natalie Diaz had for us was to take an infant CPR class. 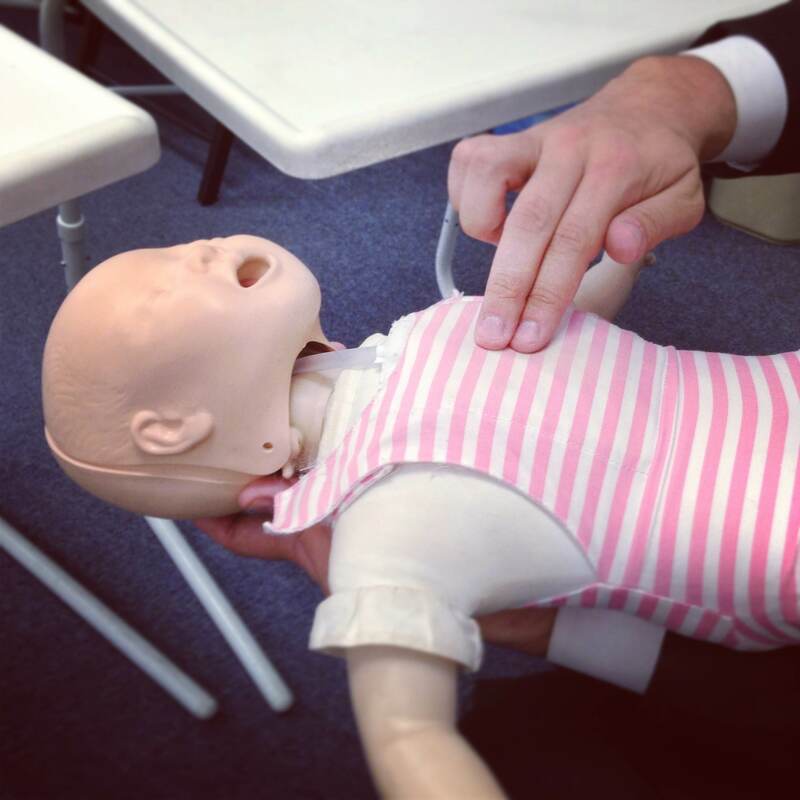 We heard about Little Hearts CPR here in NYC, signed up for the class online, and in no time at all we were sitting in a classroom in the West 30s with a dozen parents and parents-to-be, and a dozen infant CPR dolls. Matt and I breathed a little sigh of relief after the 2.5-hour class. Hopefully if our kids have an emergency (or a kid at the playground, or a friend’s kid, etc.) we’ll be able to help. The peace of mind was worth every penny.